It seems that the new inductee into the mobile RTS hall of fame is finally in the house, and its name is Art of War 3: Global Conflict. As you might already know, especially if you regularly follow developments on the RTS mobile scene, Gear Games is a seasoned Russian developer mostly specialized in old-style RTS games, drawing inspiration from the very best creations in the genre. Their first trailblazing game in the Art of War series had appeared way back in 2005 and instantly sparked an RTS revolution on the mobile platforms. Since then, they had plenty of time to ponder on the components that make a perfect RTS game and how to implement them in practice. After almost five years in development, the third installment in their award-winning series had been officially released, and it’s safe to say that the result of their long-running labor of love had come very close to the coveted ideal of RTS perfection. As was the case with their previous Art of War games, they’ve once again decided to look beyond the short-lived trends and searched for inspiration in the very best achievements of the RTS genre. Looking up to the landmarks of the RTS genre such as Dune 2, Command & Conquer series, Red Alert, and starcraft, developers refined all their key features and brought them together in a game that effortlessly manages to look traditional and innovative at the same time. However, if all this talk about retro influences, classics, and tradition makes you just a bit anxious, don’t be, because you definitely won’t be presented with some retrograde product. 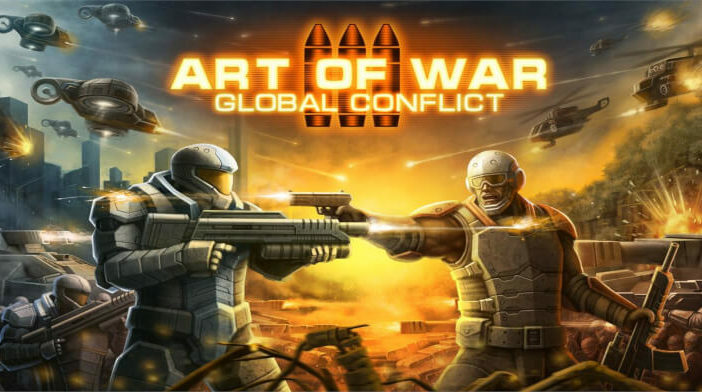 As it happens, Art of War 3: Global Conflict apparently has everything that a demanding modern RTS audience could wish for, including spectacular 3D graphics, movie-like soundtrack, engaging background story, great tactical depth, electrifying PvP and co-op options, as well as a zillion clever little details that separate a truly ace game from an average title. On top of everything, the game boasts controls and game mechanics that are flawlessly optimized for mobile games, which is a rarity even with titles that are developed exclusively for mobile phones. In short (and to ease all your potential concerns once and for all) Art of War 3: Global Conflict is a game that’s polished to a dazzling high shine in virtually all the relevant aspects. As was the case with most classic RTS games, there are two main factions in Art of War 3: Global Conflict – Resistance and Confederation. As their name implies, the Resistancesideare your typical rebels and freedom fighters, who use revolutionary rhetoric and guerrilla methods to disrupt the world order. The Confederation faction is the regimented authoritarian side which tries to uphold the status quo at all costs. Both sides insist that they are the ones who fight for justice, peace and other lofty ideals. While this may contribute to the initial sense of confusion, especially if you’re were expecting the run-of-the-mill moral polarity, this is actually an extremely smart move on the part of the developers. Unlike some other games which use forced black and white distinctions, the lines are blurred here, there are no good and bad guys (or, at least they aren’t so apparent), so the sense of immersion and identification with either of these two options is considerably enhanced. You’ll feel like you’re playing actual factions, with their respective ideologies, goals, and agendas, and not just impersonal military groups that come in blue or red color. Resistance, driven by the desire to shatter the brittle façade of propaganda and reinstate freedom and social justice that belonged only to a privileged few, attacked the Confederation. On the other hand, leaders of the Confederation (who established themselves as guardians of the peace and architects of the brave new world), responded swiftly and efficiently to repel this rebellion. The spark of resistance was ignited in Argentina, a country famed for its revolutionaries and guerrilla warfare, so it’s a nice thing indeed that developers made sure to pay attention to every minute detail and create a convincing setting for their conflict. That first few skirmishes will trigger a conflict of larger proportions that will soon overwhelm the rest of the world. The background story continues on the events of the previous game and is set in the near future. That means that war represented in Art of War 3: Global Conflict is, in a sense, painfully relatable to the real conflicts that are tearing the planet apart right now, which adds a serious note to the whole affair. On the other hand, that “near future” determinant gave developers an artistic license to introduce an arsenal of plausible, yet technologically advanced weaponry, at the same time fun and challenging in combat (not to mention totally badass). Art of War 3: Global Conflict is mostly advertised as an MMO title with PvP, PvE and co-op options, but that’s not entirely true – it also boasts a large and well developed single player campaign that will serve as a basis for your other military exploits. What do I mean by that? First of all, the campaign will show you the ropes and toughen you up for the upcoming multiplayer challenges. However, during the campaign, you’ll also research new structures, units, and equipment that you’ll use in multiplayer battles. These new technologies can be unlocked only during the campaign, so, if you don’t intend to deprive yourself of advanced equipment and put yourself at a serious disadvantage, give the campaign a shot. Speaking of equipment, each of the opposing factions has its own arsenal of weaponry, buildings, and units, as well as their own unique combat tactics. Confederation has the benefit of advanced technology and heavily armored vehicles, while Resistance relies on their guerrilla ploys, mobility, and stealth capabilities of their units. Of course, for reasons of the overall balance between the factions, the units and their combat capabilities are relatively analogous – for every class of building or unit on one side, there is an equivalent on the other (for instance, Resistance has Sniper Towers, Confederation has Bunkers). The main thing is that, while developers managed to achieve almost ideal balance, both factions are still pretty much unique, and will provide you with two very different experiences, with distinct gaming mechanics and tactical options. Of course, the choice of the faction will depend solely on your personal preferences and gaming style. Since you’ll be able to switch between the factions at any time, without any penalties, so be sure to try out both sides. Currently, each faction has 3 types of infantry units, 6 vehicles (3 light and 3 heavy), 3 ships and 3 air units, as well as access to weapons of mass destruction, such as space strikes and nukes. Every single building or unit in the game can be customized and upgraded multiple times, and truthfully that’s one of the best and most rewarding segments of the game, not to mention that it’s extremely important because of the multiplayer. You’ll be able to influence factors such as armor, types of rifles and individual first aid kits of your infantrymen, up to the equipment of advanced airplanes. The same thing can be done with buildings and, depending on the type, it will boost their productivity and unlock new unit types. As I’ve already mentioned, controls and gameplay are some of the many highlights of this game. All veterans of RTS games will immediately recognize the game mechanics from countless other RTS games. However, the way they’ve been implemented on the mobile phone medium deserves standing ovations. You’ll be able to perform a series of tactical manipulations just by simple tapping. For instance, double tapping will select all units of the same type. If you tap on the ground beside a group of units, that will select them all, regardless of the type. Tapping on the rectangle icon in the right part of the screen will enable you to select easily them using the classic RTS drag selection box. You’ll even be able to activate freehand selection in any shape you like and save up to three groups of units, preparing them for quick selection. The game also supports various styles of unit commands such as regular move, attack move, or patrol, which are all initiated with different tapping combinations. One thing is certain, you’ll be extremely thankful for this and other handy features when you find yourself in some of the frenzied combat situations that are abundant in this outstanding game. Of course, multiplayer is where this game truly shines. However, it’s not to be taken lightly, and for that very reason, you’ll be allowed to engage in PvP battles only after you’ve completed the first region of the campaign (i.e. first six missions which serve as a sort of tutorial). Even then, although the game does its best to hook you up with players of a roughly same level, PvP battles usually tend to be brutally challenging, especially for inexperienced players. As a rule, opponents will quickly build their base, scout the surroundings, collect all the resource containers on the way, while constantly probing your defenses for any weakness. After you’ve earned the rank of Major Grade 1 and the game estimates that you’ve sufficiently perfected your skills in the crucible of war, you’ll unlock other multiplayer options such as Tournament and Skirmish that will truly put your combat proficiency to test. While Art of War 3: Global Conflict may not be a ground-breaking title by modern standards, it is certainly a game that flawlessly managed to perfect all major tendencies and features from the very best RTS games. With its sleek visuals, epic campaign, elaborate customization system and rich multiplayer opportunities, this is the title that permanently sets its gold standard in the world of mobile RTS games.